Quad biking, skydiving, sandboarding and stargazing: KRIS GRIFFITHS explores the colossal open spaces and quaint colonial charms of Namibia. Glaciers, rainforests, canyons — all epic natural wonders to behold, but for me there’s something even more wondrous about deserts: vast, empty and parched landscapes where life struggles constantly to survive. It’s the sight that greets me from my aeroplane window as we cross the Angolan border into Namibia, sprawling endlessly into the distance before merging with the blank African sky. After living so long on a damp leafy island I couldn’t wait to be down there in the middle of it, enduring its heat, wandering its dunes and searching for the signs of life I’d only seen previously on wildlife documentaries. It would all have to wait 24 hours though as I was spending my first day and night in Windhoek, Namibia’s capital and first point of entry by air, which by notable contrast sits high among the rolling hills and tufty grasses of the central highlands, serving as a magnifying glass over the land’s history, geography and demography. First and visibly foremost Windhoek is a beacon of Namibia’s colonial past (the country was annexed by Germany in 1884 and renamed German South-West Africa before gaining independence from South Africa under British rule in 1990). The surviving legacy is German colonial architecture, street names and restaurants, an annual German carnival, and although English is the official language you can speak German just about anywhere. The city centre is clean, modern and well laid-out, with tree-lined avenues and bustling shopping precincts giving it a noticeable cosmopolitan vibe. The only negative I could find was a main thoroughfare named Robert Mugabe Avenue, which my guide explained was a sore point, arising from their first president’s friendship with the Zimbabwean despot during Namibia’s fight for independence. A final eye-opener was how this, its largest city, has a population of only 250,000, illustrating how sparsely populated is Namibia — seven times bigger than England but with only a 25th of its population (two million to England’s 50). There really is a lot of space to play in. After spending the night in a stylish hillside guesthouse called Olive Grove (olivegrove-namibia.com) I set out by car the next morning on the long straight road into the big bad Namib — the world’s oldest desert. Windhoek’s verdant valleys soon segue into its unending golden expanse and welcome distractions begin looming around me in the form of wild animals I’ve only ever seen at the zoo, like zebra and ostriches. Five hours and a hundred photos later the wide blue Atlantic opens up the horizon, heralding my arrival at Namibia’s coastal ‘summer capital’ Swakopmund. Wedged between desert and ocean, and offering plentiful sand and water-based activities, ‘Swakop’ is a magnet for Namibian holidaymakers, as well as South Africans and (mainly German) Europeans, whose clipped accents resound against a backdrop of pastel-painted colonial buildings to create even more of a Bavarian flavour than in Windhoek. But behind the quaint houses, souvenir shops and market square, the vast ancient desert eerily waits, beckoning you towards it like a siren. After checking in at Swakopmund Guesthouse (swakopmundguesthouse.com), contrastingly decorated with oceanic paintings and pebbles from the nearby beach, I hit the Namib on foot after sunrise. Disappointingly, however, I discover that the morning winds and fog-banks formed from ocean air hitting desert suddenly make the region feel like England on an overcast day, so when I arrive it’s no longer the epic scorching terrain I’d been anticipating. 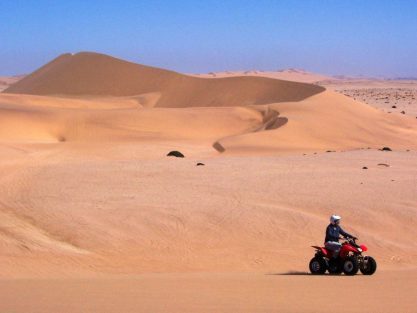 Frustrated, I decide to hire a quad and tear around the dunes at full throttle, something I discovered Brad Pitt spent most of his time doing while staying here for several months with now ex-wife Angelina Jolie for the birth of their daughter. With a Desert Explorers guide (namibiadesertexplorers.com) I spent the morning hurtling through what reminded me of the Tatooine pod-race circuit in Star Wars, then performing arse-tightening ‘rollercoaster’ manoeuvres — zooming up a dune’s steep slipface, turning at the apex and sliding straight back down. The following morning I’m back driving through the dunes, this time carefully in a camouflaged jeep with local wildlife expert Tommy Collard, whose ‘Living Desert’ tours are titled for good reason — what appears to be a barren land, bereft of life, has another world thriving beneath the surface. 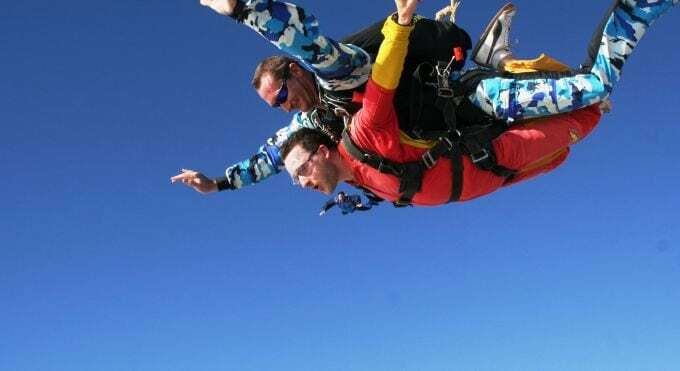 Later that afternoon I’m freefalling through the sky at terminal velocity, having gathered enough courage for a skydive (skydiveswakop.com.na). For me the worst part’s the 20-minute light-aircraft flight 10,000ft over the desert with an open doorway presenting what you’re about to jump into. Your heart palpitates for good reason as you confront your worst fear, but after the intensity of freefall then the serenity of floating to earth beneath an open chute you realise why it’s the prototypical life-affirming feat that all thrillseekers must chalk off their bucket-list. Chalking mine off over the Namib Desert lent it that extra layer of memorability. 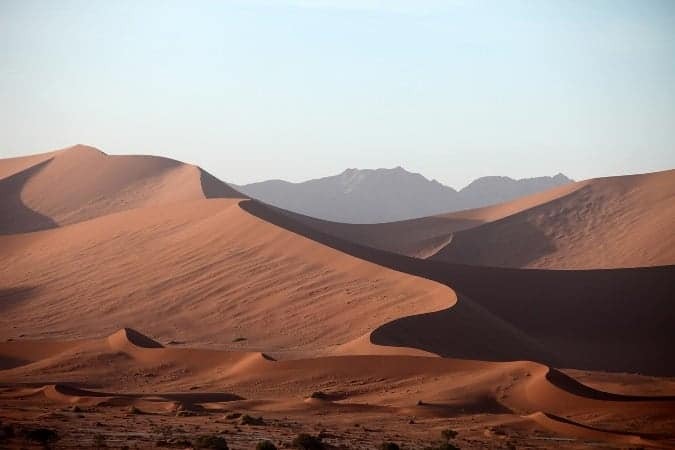 That evening I’m granted yet another perspective — the Namib by night — joining my tour-operators for a barbecue and overnight camp in the dry Swakop Riverbed, surrounded by small mountains whose rocks contain so much iron that they clang when you bang them with a stone. The amount and quality of local meat thrown on that barbie really hit home how voraciously carnivorous are Namibians — my first Windhoek meal had comprised ostrich, kudu, zebra and crocodile on one plate (for less than £7). Vegetarians need not apply. And judging by the number of Windhoek Lagers (Namibia’s national brew) we sank, tee-totallers need not apply either. My abiding observation that night was that the desert is one of few places you can see the stars properly. Through clear, cloudless and unpolluted air, miles from city lights, you understand why it’s called the Milky Way. 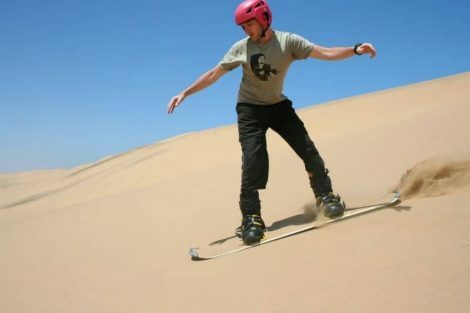 In the light of the final morning I exploit the desert one last time, whistling down its dunes on a sandboard with some local sandboarders. It completely subverts the snowboarding experience, swapping white mountains and icy air for golden slopes and sweltering sun. Unclipping my boots after the last descent, adrenaline subsiding, I feel I have wrung every last drop of recreational activity from this giant sandpit. It was a bittersweet evening back at my final lodging, Swakopmund Boutique Hotel (swkboutiquehotel.com), a luxurious new complex near the beach which couldn’t stop me hankering to be back in the desert beneath the stars again, a feeling that persisted through my flight home to present day. I’d only seen a fraction of Namibia, a country which despite its colonial past remains authentically African, with so much untouched land you feel like one of only a few visitors ever to have explored it. Whether driving through its desert or freefalling over it, sleeping beneath its dunes or tearing down them, you’ll leave part of yourself there amongst the ancient grains. Kris Griffiths flew with Air Namibia with his activities and accommodation organised by Namibia Tracks & Trails. 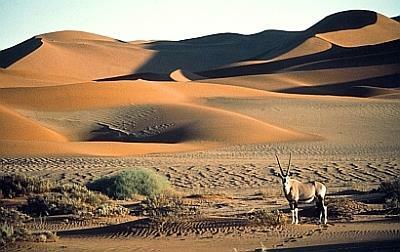 For tourist information visit namibiatourism.com. TOP IMAGE: Namibia desert, dead trees (Via Pixabay).